So you're in the search for some happy birthday wishes, you've come to the right place! 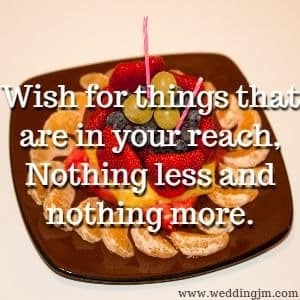 Birthday wishes wants to help you in your search. So we've compiled some samples of birthday wishes for you to view. You can use them in so many different uses. If you decide to make your own birthday card or write a birthday toast, birthday wishes could be the help you are looking for. Wishing you the best birthday yet! Many great moments in your next year of life! When you blow out your candles today, wish for something great, because you deserve greatness! Wishing you a very happy birthday. May all your wildest wishes come true! Sending birthday wishes to an amazing friend. Hoping this year is even better than the last! Blow those candles out so all your wishes can come true. Then we can party! Here is a verse I've been working on to tell you how much I care, just the mere though of you is all that sometimes I can bare. All the best in your years to come. You have always been like a brother to me, and on this day I wish to extend brotherly birthday wishes. 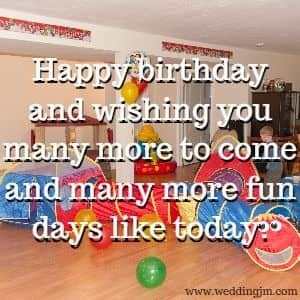 Wishing you lots of fun and excitement that only birthdays can create. So get moving to have a fabulous day! Sending you a frendly Happy Birthday greeting on one of the most happiest days of our lives. The day you were born was such a joyous occasion we couldn't let it pass you by without sending our wishes along. Happy birthday and wishing you many more to come and many more fun days like today. Wishing you many more great and happy years ahead. Try and not waste a single second of each minutes. Hello my birthday friend, and a sweet happy birthday to you and wishing you a wonderful birthday filled with joyful fun! I've never realized how hard it is to write a birthday message until I sat down to write yours. But then I realized, you know I'm not a man of many words so here it is, Happy Birthday love. Wishing you only the very best on your birthday. Blow out those candles and see if your wish comes true! I wish I could give you everything you deserve for your birthday, sing you a song, write you a rhyme or find the perfect gift. But then I remembered all you want is to be loved, and that is exactly what you are. There is a saying that says those who have the most in life live the longest, and you have many birthdays under your belt. Why not one more! May you have the happiest of birthdays and the best year yet, celebrated with family and friends. 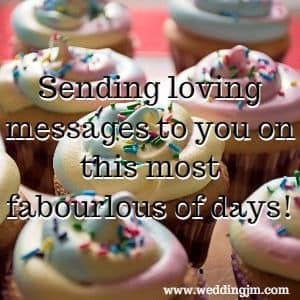 Sending loving messages to you on this most fabourlous of days! May you receive a message today that reminds you why another birthday has come your way. May you feel the love of family and friends as you celebrate turning another year older and may they shower you with joyous laughter. Remember that song, "how old are you..." well I'm here to tell you age doesnt matter. It truely only matters how old you feel. Wishing you only the best on your birthday. Your friends will toast to you about how wonderful a friend you are. Finding a card that says exactly what I want to say is nearly impossible. There are no words to say to express my love for you. Happy Birthday Babe! Our wish for you on this birthday is for you to find true happiness in whatever you are seeking. I tried to write you a poem, but all I could think of was roses are red poems so I thought I would just tell you in a simpler form that I hope you have a wonderful birthday. Hope the coming years will be the most perfect yet. If they are anything like the example you have just given us this past year, it will be a blast. You have always been the funny one, but I'm here to remind you, you are also the older one! You deserve so much on this birthday! I hope you are given everything that you deserve. May this birthday make you the happiest you've been in years. I must say, the best toast I have ever hear was the one I heard on your birthday last year. May this year bring on even better toasts from family and friends. Hope you get everything you could ever ask for this year for your birthday. We always like to pretend that getting older was a crule joke, but in reality it really isn't. Look at all the wonderful years we had together with many more to come! Happy Birthday! Birthdays are a time of acceptance for ourselves. We all need that at least once a year. A birthday to be thankful for! Wishing you many more birthdays and thankful wishes to come. How can someone celebrate a birthday with everything that you deserve! There is no celebration worthy of everything you deserve! 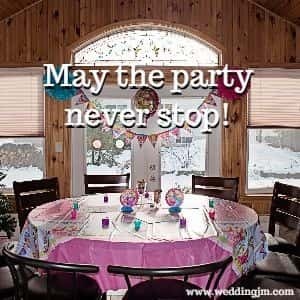 I love a good party and I know the best date and person to party with! Excited to celebrate with you! Sending birthday love your way with hopes of many hugs and kisses along the way! Another year another birthday, another fun and exciting party to celebrate with my best friend. A birthday wish for a birthday love. 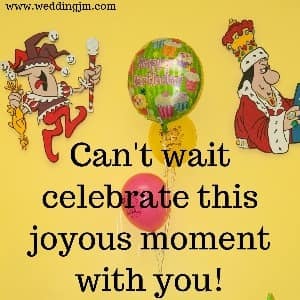 Can't wait celebrate this joyous moment with you! There is no birthday that can be as sweet as you are but we can always try! Birthdays are either a great love once a year or a once a year tramatic event! Choose to make it a yearly great love! 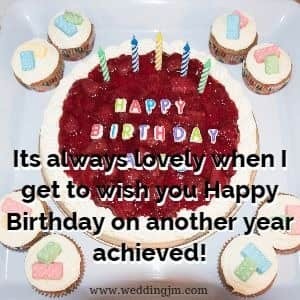 The best way to send birthday wishes is by spending the time to think of a personal message that explains exactly how much you love and appreciate the birthday guest of honor. I care about you and wish you a wonerfully unique birthday surprise! Special doesn't begin to expain all that you deserve for your upcoming birthday! There is no better thing I'd rather do than celebrate your birthday with you. A glorious birthday for a wonderful and passionate friend. Hoping your birthday is as full of passion as you! Happy birthday Girlfriend!!! To the best friend in the whole wide world. Wishing you nothing but happy memories this birthday. Sometimes, serious just isn't the way to go, so why not go a different way with your birthday message. Making someone laugh on their birthday is definately an awesome birthday gift! 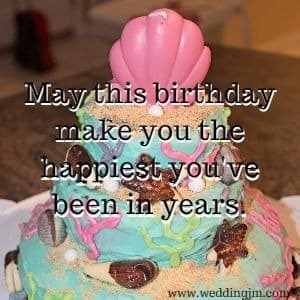 Find that perfect birthday saying or find ideas to inspire the perfect birthday message below written for you by Julie Hebert. Wow, how time seems to fly right by without us even realizing! That must be how you got so old! Happy Birthday! Hard to believe it's your birthday again. Those numbers just keep on getting bigger and bigger! Its always nice to know you will always be older than me. I'll try to not let it go to my head! 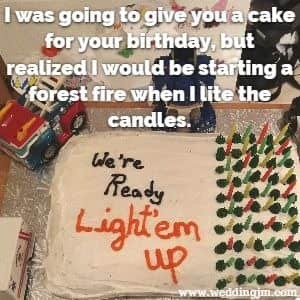 I was going to give you a cake for your birthday, but realized I would be starting a forest fire when I lite the candles. So I changed my mind! I love the saying, "it's the thought that counts", this way I get to think of the perfect gift and don't have to buy it for you! Its funny how some people need a birthday weekend to celebrate their birthday. When you get as old as we are, you just need a few hours! You know you should really start celebrating your birthdays! Its a proven fact that birthday are good for you! The more you have the longer you live! Have you ever noticed that men don't ever seem to grow up. Every birthday is llike having another child being spoiled for the day. You are one of the wisest people I know. Must be all those years adding up! Celebrate till the cows come home! You aren't in the pastures yet. 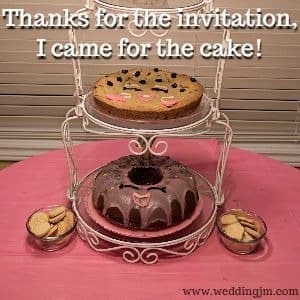 Thanks for the invitation, I came for the cake! You know when you are getting old when everything hurts and we laugh instead of crying! If I'm old, what does that make you...ancient? I don't know about you, but I love growing up. Its the getting old part I could do without! Why did we spend so much time as a child trying to grow up, when all we do now is try to feel younger? When we were kids birthday parties were always so much fun. Now they consist of stories of when we were young! The awesome thing about having a cake with so many candles on it? When you make a wish, you'll get to make another and another and another! There's no way you'll be able to blow out all of those candles at once! How on earth did you reach this age! Its like you blinked and you where 50! I made you a birthday cake, but on the way over I got hungry and ate it! I'll make you another for your next birthday! The way things are going, we'll be celebrating that one soon enough! I've always wondered, why does time have to fly when we're having fun! It should go slow so we can enjoy it! Its always lovely when I get to wish you Happy Birthday on another year achieved! Good job and way to go, you've done it! At 83 you shouldn't give a whoot about anything! We hope you have found these birthday wishes helpful and informative. Feel free to take any of these and use them however you need them. And remember, you can't have to many birthday wishes. You never know when you'll need some, so come on back every time you realize that its time for another. We'll be here and we plan on adding new birthday wishes every now and then.